I love these tuna can clocks! I had a lot of fun reconnecting with "South African time" ... things get done "just now" (soon), "now now" (in a while) and ... um ... whenever, I guess. It's all quite loose. Want to make one? Go here. Beautiful mirrors framed with pop cans ... Some simple instructions here. DRUM magazine is iconic ... so celebrating these vintage covers in a necklace is fitting. Soda/Beer can caps. No tutorial for these... they look very tricky. I really enjoyed how traditional RSA brands (All Gold, Koo, Lucky Star, Joko etc) are being celebrated in products. "Local is Lekker" (Local is good) is a slogan seen everywhere ... SA pride on display. Above and below: Candy and gum wrappers rolled up tight and woven into place mats. Huge amount of work! Oil cans have always been upcycled ... the guitars are famous (more on that some other time). I loved the detail in these airplanes. Soda can coasters ... simple tutorial for you at The Idea Room. Fun combination of soda cans and vinyl... lots of work! Look out for another South-Africa-centric post in the near future ... that one will focus on more high-end repurposing/upcycling and fine art. 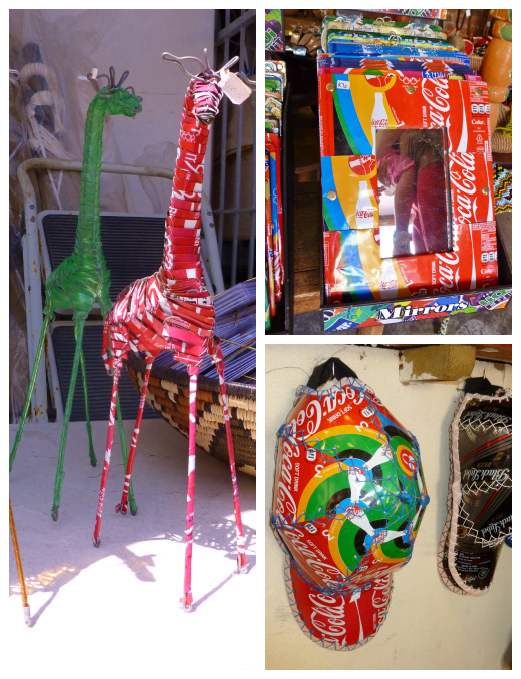 59 comments on "Upcycle: South African style..."
Wow, creativity unlimited by raw materials. Just use what you've got. Amazing. Thanks for sharing. I love all the colors. Also, it's amazing how commercial products can be turned into art that looks very individual -- not like a room full of corporate folks designed them for the bottom line. I LOVE these! So unique and quirky! The giraffe and the coasters are great! But my favorite is that record purse! I would rock that everywhere! Love these, colorful and fun. Giraffe is sooo cute! Oh I just love all your new stuff! Thank you for the giveaway. My sister has had a purse like that and it has lasted a long time! I want everything...they are so cool! That giraffe would make a great conversation piece! I have many South African friends and this would be great fun to win! I loved all the photos! I bet the trip was awesome:). My hubs is from George, South Africa. He moved to the US when he was 12. That was 28 years ago. He would love to go back for a visit. He has such fond memories of his time there. Now onto your giveaway...I would love to win this for my daughter! She collects giraffe stuff (she is 12) and this is such a cool piece! i've never seen anything like all of these things. great work and so different! These true art pieces are spectacular. Thank you for the chance at owning one. the giraffe is cute! i hope to win. This is so unique, I adore it. Love this prize. What a unique idea. Thank you for the giveaway! I love how much was put into each item made! They've really got the idea of recycling and profiting down! Go South Africa! So neat! Everyone needs at soda can giraffe! What fantastic pieces! Fingers crossed! That is so neat, I love all the things that can be made out of cans. i LOVE upcycled products! thanks fo what you do! well that's the coolest reuse I have seen. Everything is so unique and wonderfully unusual! They all look super cool and creative! Love them all! i love their products, great way to use up old stuff. FANTASTIC POST AND WONDERFUL GIFT! !